LAS VEGAS -- Despite China’s fast-growing presence in the global display business, South Korean display makers remain undisputed leaders when it comes to future innovation, according to the chief of Merck KGaA’s performance materials division on Wednesday. “Indeed, China has been putting lots of emphasis on driving the growth of the display technology. But if you look at large companies, you can see that the Korean companies are still very strong in innovation,” CEO Kai Beckmann said in an interview with The Korea Herald on the sidelines of the Consumer Electronics Show in the US. According to the Merck KGaA executive, Korean panel makers, including Samsung Display and LG Display, are key players driving the next generation of display technology, such as organic light-emitting diode displays that are bendable. Based in Germany, Merck GAaA is a supplier of performance materials and solutions that go into producing memory chips, processors, liquid-crystal displays and OLED technology used to produce smartphones and just about any electronic device. Major producers of display panels and semiconductors, including Korea’s Samsung, LG and SK hynix are big customers of Merck’s performance materials division. At CES 2019, a number of products using next-generation flexible display panels were introduced, including LG Electronics’ rollable TV. The LG Signature OLED TV R, touted as one of the most impressive innovations at the tech show this year, is expected to begin sales in the latter half of the year, becoming the world’s first commercial rollable TV. China’s Royole also stole the spotlight at the tech show by showcasing the world’s first foldable smartphone with a flexible display: the Royole FlexPai. While these technologies are impressive, it is too early to determine whether they will be successful if commercialized, Beckmann noted with caution. “It’s fascinating to see how display technology is able to adopt very new changes. And having a ‘fun factor’ always gets lots of attention. In the end, however, consumers will decide whether it’s better to have a slimmer phone, or a foldable phone with a bigger display,” he said. 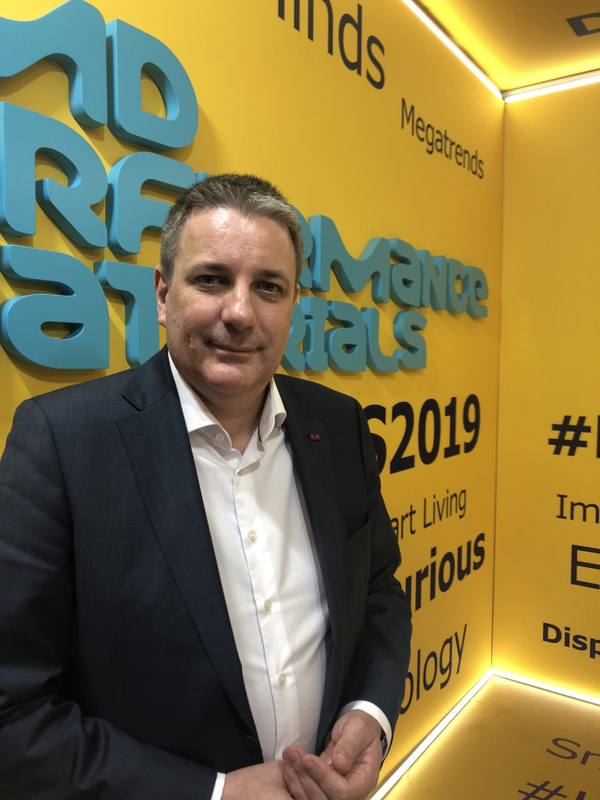 Beckmann’s remarks came as Merck KGaA showcased a booth at the Westgate exhibition hall as part of CES 2019. In the US, the firm goes by the name EMD Performance Materials. Ditching the industrial showcase model typically featuring bottles of chemicals, the company designed its booth around innovation instead, adopting a colorful design scheme. Looking ahead, Merck will continue to work with customers in the electronics business, including Korean tech giants, on building display panels with improved characteristics while helping them to optimize production costs. “Korea is and will be one of the leading technology hot spots for displays as well as for semiconductors. With our solutions we want to contribute to the success of our customers in Korea but also in other regions,” Beckmann said.